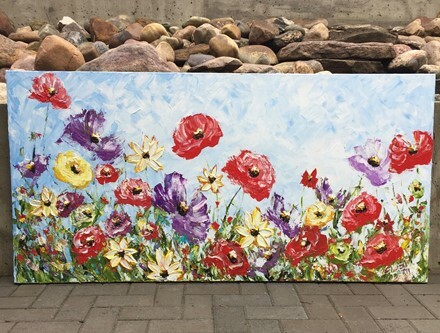 This piece was painted during patio season at the Hotel. Sometimes people ask me how & why I paint so quickly. I compare it to the urge to call up that friend that came to mind & then spending time with them. You're so excited to see them & must have a conversation. That's kind of how it is for me & painting. It's a conversation I must have with the paint & the canvas. I like to complete the painting in one session. Like the beginning & ending of a talk with a good friend.